NHL Central Scouting on Thursday upgraded four players to A status on its preliminary players to watch list of prospects for the 2013 NHL Draft. 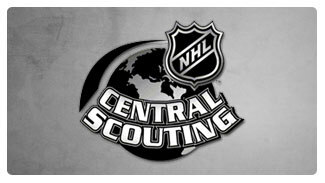 In addition to the upgrades, Central Scouting identified several players who happen to be tracking higher and will receive considerable attention in anticipation of its preliminary rankings list, which will be released in November and rank the top 25 prospects in the Ontario Hockey League, Quebec Major Junior Hockey League, Western Hockey League and United States Hockey League, as well as various Europena nations. The preliminary watch list, comprised of A-, B-, and C-rated players, is sent to NHL team scouts for the purpose of tracking the top draft-eligible players entering the 2012-13 season. All A-rated players have been identified as potential first-round picks, while B players are considered second- or third-round candidates. C-rated players are thought to be possibilities to be picked between the fourth and sixth rounds. The initial watch list, released Sept. 17, can be accessed here. Those players who have been upgraded to A players are forward Stephen Harper of the Erie Otters and goalie Spencer Martin of the Mississauga Steelheads in the Ontario Hockey League; Valentin Zykov of Baie-Comeau Drakkar in the Quebec Major Junior Hockey League; and goalie Eric Comrie of the Tri-City Americans in the Western Hockey League. Harper, who was listed as a B skater in September, has four goals, 10 points and a minus-3 rating in 13 games this season. He's coming off a successful rookie season in which he produced 24 goals and 35 points in 63 games. Martin, a B-rated goalie in the initial release, is 6-1-0 with a 2.16 goals-against average and .934 save percentage in eight games. Zykov was listed as a C skater when the list first was released because scouts had limited viewings of him while he played for CSKA Moscow in Russia last season. In his first season in North America, however, he's turning plenty of heads. The 6-foot, 210-pound left wing is tied for second on the team with 11 points, and has six goals and a plus-6 rating, in 12 games. The 6-1, 167-pound Comrie, of Newport Beach, Calif., is 9-3-2 with a 2.26 GAA, .925 save percentage and two shutouts in 14 games. He was listed a B goalie in September. According to Director of Central Scouting Dan Marr, many other players are tracking higher at this stage in the season as compared to where they stood last month. "Scouts are really taking a good look at the [QMJHL] since the expectations there are pretty high," Marr told NHL.com. In fact, there are five players from the QMJHL who are trending upward, including forwards Vladimir Bryukvin of the Rimouski Oceanic, Laurent Dauphin of the Chicoutimi Sangueneens and Jean-Sebastien Dea of the Rouyn-Noranda Huskies, and defensemen Maxime Gravel and Jan Kostalek of Rimouski and Dylan Labbe of the Shawinigan Cataractes. Kostalek, a right-handed defenseman chosen No. 10 overall by Rimouski in the 2012 CHL Import Draft, played 32 games for HC Sparta Praha U-20 in the Czech Republic last season. He went scoreless for Praha in 10 games in the Czech Extraliga. Kostalek, who has one goal, one assist, 20 penalty minutes and a plus-3 rating in 13 games, is regarded as a mobile defenseman with some physicality to boot. Dea is tied for the league lead with 26 points, including 16 goals, in 14 games for Rouyn-Noranda. He had 17 goals and 32 points in 50 games last season.